With so many factors at play, it’s challenging to most effectively engage healthcare providers (HCPs), determining the optimal sequence of messages to send, whether via email, in person, or another mode of communication. Chief Science Officer Marc Cohen and the data science team at Aktana recently published their research in this area in The Journal of the Pharmaceutical Management Science Association, setting forth a successful machine learning approach for identifying message sequences that maximize open and click-through rates. Machine learning is pivotal for accurately predicting how an email message will be received in the future. 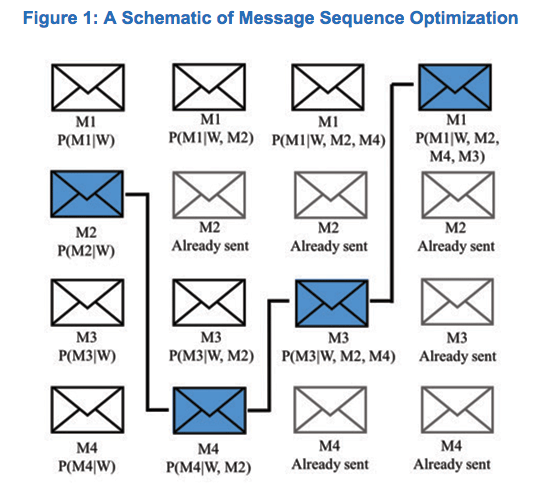 The method proposed uses machine learning models to collect baseline HCP reactions or message history data and uses it to predict the probability of an email being opened or clicked through. Once captured, the probabilities of all potential messages are compared to identify which sequence will best maximize HCP interest. As new messages are added, the models refit and continue providing a personalized sequence that optimizes the chance of an open or click-through. When recently deployed for a customer, this method doubled email open rates within just three months. This customer had almost 400 representatives who contacted approximately 1260 HCPs regarding a single product.